The Department for National Drug Control [DNDC] said that September marks the 25th year of observing of National Recovery Month, and over the course of the next four weeks the DNDC will join its partners in the community to celebrate those individuals who are in recovery. The theme for this year is “Join the Voices for Recovery: Speak Up, Reach Out”, which represents the many ways that people can prevent behavioral health issues, seek treatment, and sustain recovery as part of a commitment to living a mentally, physically, emotionally, and spiritually healthy life. With the Bermuda Assessment and Referral Centre [BARC] reporting that some 307 persons sought assistance for substance abuse and dependence in 2013, the Premier and Minister of National Security Michael Dunkley said he is pleased that this very important issue is supported locally by the DNDC via the Nelson Bascome Treatment Centre and its partners; BARC, Bermuda Youth Counseling Services, Caron Bermuda, Focus Counselling, Salvation Army Harbour Light Programme, Turning Point, CADA and PRIDE in treatment and prevention. Premier Dunkley said, “Ensuring a stronger and healthier community is a commitment of this Government. 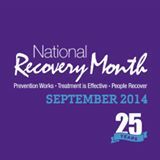 For 25 years, Recovery Month has served to educate the public about the importance of getting treatment for substance abuse. “The anguish and pain of addiction has a significant impact on our community, and Recovery Month serves as a reminder to our residents that treatment options exist here in Bermuda. “We want to encourage those afflicted to seek the services of substance abuse treatment or mental health treatment by utilizing the expertise available at facilities and programmes on the Island. “This year, to raise the public awareness of Recovery Month, the DNDC has planned a series of events aimed at engaging and educating the community about importance of supporting those who are recovering or who have successfully recovered from a substance dependency. “It is our hope is that through these activities, people will recognize that while the road to recovery may be difficult, the benefits of preventing and overcoming mental and/or substance use disorders are significant and valuable. The month long events range from recovery walks, group barbeques/picnics, media outreach and training events to raise awareness about prevention treatment and recovery support services available locally. According to the DNDC, Recovery Month is an initiative of the Substance Abuse and Mental Health Services Administration, within the US Department of Health and Human Services, in collaboration with approximately 200 Recovery Month Planning Partners dedicated to prevention, treatment, and recovery.